Will Global Oil Demand Peak Before 2020? You are here: Home / Research / Industrial / Will Global Oil Demand Peak Before 2020? 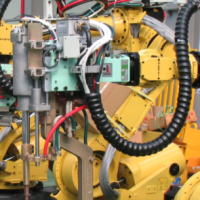 If current trends in the advancement of electric vehicle (EV) drivetrains and autonomous technology continue, oil demand could peak before the end of the decade. ARK’s research indicates that battery system costs will drop significantly, driving EV demand to levels that far exceed policymakers’ expectations. 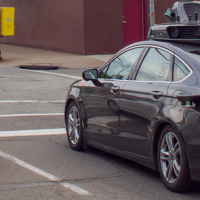 In addition, Uber-like autonomous taxi services will lower the price of transportation precipitously, further increasing the share of miles driven on electric drivetrains. 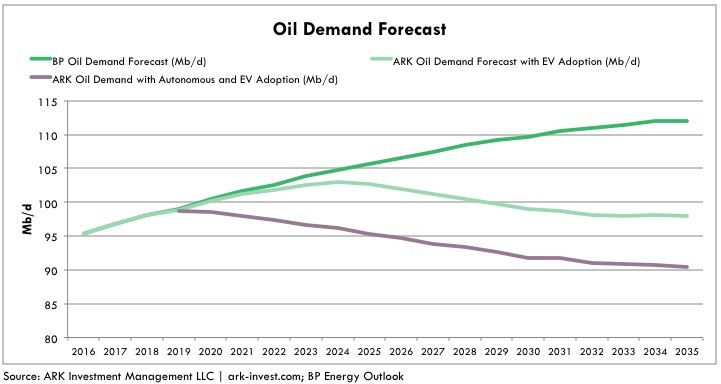 As a result, while BPBP1 forecasts that global oil demand will rise from roughly 94 million barrels per day (mbd) today to 112 mbd by 2035,2 as shown below ARK’s research suggests that oil demand will peak below 100 mbd and decline to 90 mbd by 2035. Even if autonomous technology does not commercialize as rapidly as we anticipate, the uptake in EVs alone is likely to lead to peak oil demand by 2025. ARK believes that most forecasts underestimate the market share that EVs will take from vehicles powered by the internal combustion engine (ICE) during the next five to six years. Currently electric cars like the NissanNSANY Leaf, the BMWBMW3.DE i3, and the Kia Soul EV offer limited range models that sell at a premium price to their gas-powered counterparts. Consequently, forecasts of EV adoption are quite conservative. Based on our thematic approach to analyzing the potential of general purpose technology platforms, ARK has modeled the declining cost curve associated with battery pack systems, which account for roughly 20% of the EV’s cost. According to this analysis, EVs will be cheaper than ICE powered cars like-for-like on performance and quality in the early 2020s. 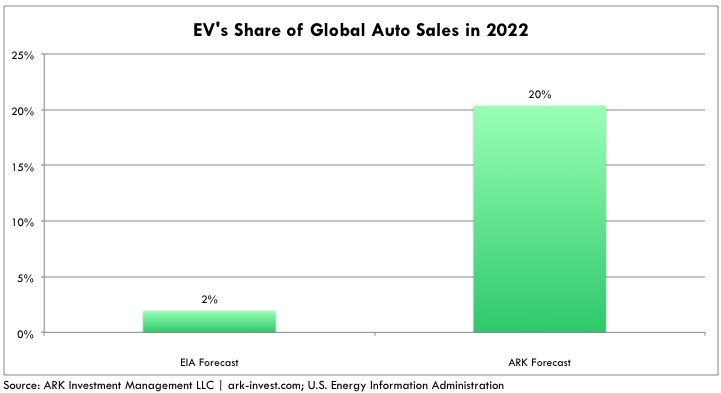 Then, as EV prices continue to fall relative to those for ICE vehicles, ARK expects an acceleration in their adoption, pushing global EV sales to 17 million units, or 20% of the market by 2022, as shown below. While it will take EVs roughly 15 years to dominate the global installed base (stock) of autos, as autonomous electric vehicles debut, their share of miles traveled could increase at a rapid rate and account for more than 50% of total miles traveled in less than 10 years. 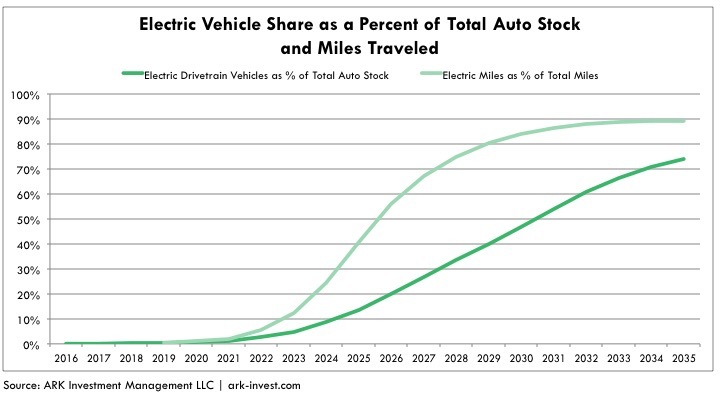 The graph below shows ARK’s expectations for EVs as a percent of the total global auto stock and as a percent of total vehicle miles traveled. ARK assumes that autonomous vehicles will be powered primarily by electric drivetrains and that individuals will limit the use of their personally owned vehicles because it will be cheaper and more convenient to ride in a shared autonomous vehicle (SAV). Even if the number of EVs on the road were to remain constant, the shift to SAVs should increase their share of vehicle miles traveled, accelerating the decline in oil demand discussed above. As can be seen below, given the rate of SAV adoption that we anticipate, gasoline demand could drop 50% by 2030. Even in the absence of fully autonomous vehicles, gasoline demand should peak in the early 2020s thanks to EV penetration alone. Autos account for less than 30% of total oil demand, while transportation as a whole accounts for 56%. Interestingly, TeslaTSLA has announced electric semis are on its product road map, and Elon Musk believes that electric passenger jets could be feasible as well. In other words, as transportation goes electric, the oil industry could lose more than half of its market. 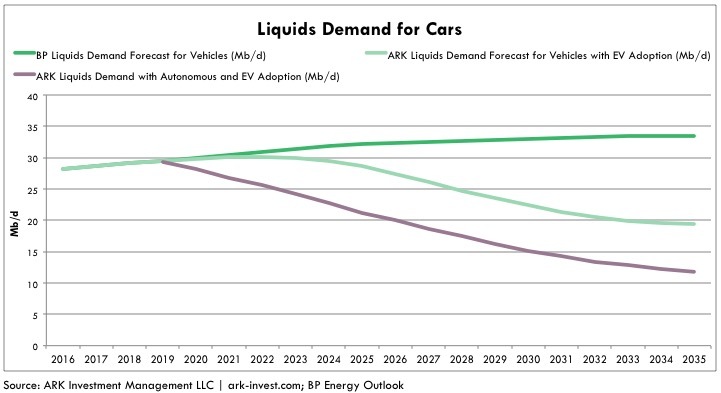 Even narrowing the scope of this analysis to automobiles, ARK believes that global oil demand may peak before 2020, having never exceeded 100 mbd, and that the oil price could become exceedingly volatile as it unwinds. When oil companies eventually begin to forecast a drop in demand, they will slash capital spending and cut back supply to salvage profitability. 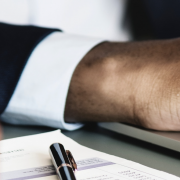 If EVs are adopted faster than oil companies are predicting, ARK believes that the profitability of downstream assets, including refineries and pipelines, could be damaged disproportionately because of their massive sunk costs. The electrification of transportation could be devastating for the more than 150,000 gas stations in the U.S., for example. From a macroeconomic and geopolitical perspective, the transition from ICEs to EVs could serve as a windfall to consumer purchasing power with the global economy no longer hostage to OPEC, diminished as it already is, or as sensitive to the price fluctuations of “black gold”. 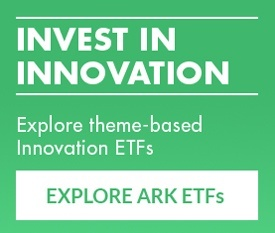 https://ark-invest.com/wp-content/uploads/2016/10/Screen-Shot-2016-11-07-at-5.29.19-PM.png 295 845 Sam Korus, ARK Analyst https://ark-invest.com/wp-content/uploads/2016/05/ARK-Invest-Logo.png Sam Korus, ARK Analyst2016-11-08 08:00:372017-02-25 01:29:42Will Global Oil Demand Peak Before 2020? 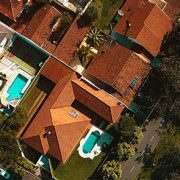 Free Residential Solar Panels? Not Worth The Money. 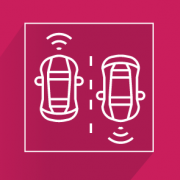 Autonomous Taxis Will Overhaul the Global Auto Industry Could Deep Learning Grow the Robotics Market Ten-Fold (or More)?